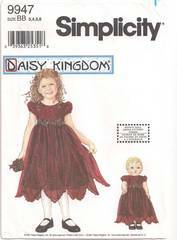 Pattern for child's dress and doll dress for 18" dolls such as American Girl. Dress with raised waistline has petal overskirt and ribbon ties extending to back. Three button closing on the back bodice. Sizes 3, 4, 5 and 6 are all included.